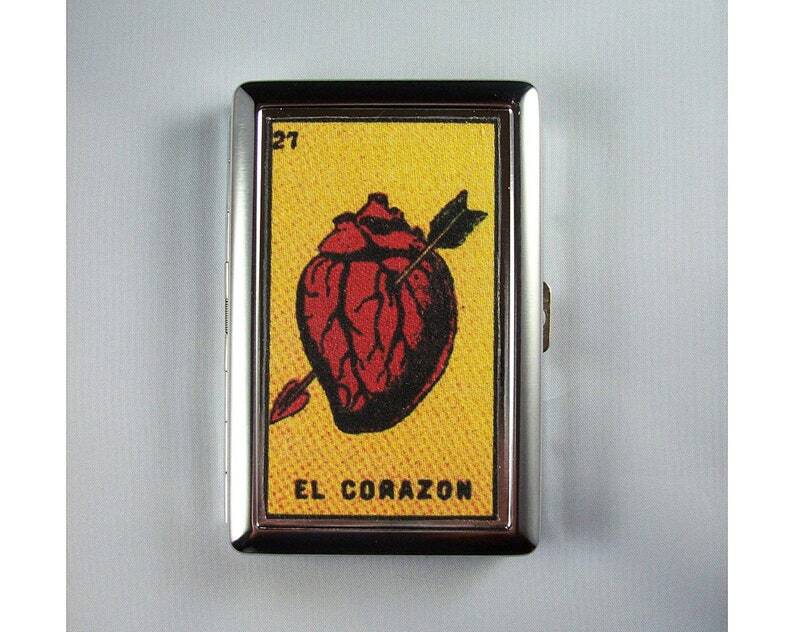 This dandy stainless steel metal wallet features an image taken from the Spanish Loteria, an amazing retro bingo game with fabulous vintage style images. This case works great as a wallet but you could also use it for business cards, an ID case or even for cigarettes! I make these cases by transferring the image onto lightweight canvas. I then adhere the fabric image onto a brand new metal case and after 24 hours of drying time it's ready to go. Excellent product and quick shipping! Would absolutely recommend. Definitely a functional wallet. The design is great and came promptly. My one qualm with the product is that if you drop it, it pops open and literally every single thing in the wallet goes flying out. Even from the tiniest drop. I'll definitely still use it, it's just inconvenient.